In the future, an entire chemistry lab could be accommodated in a tiny little droplet. 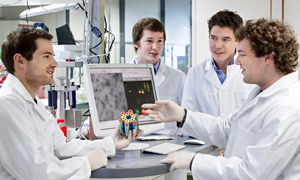 While simple reactions already work in these simplest models of an artificial cell, now a group of scientists of the Physik-Department and the Cluster of Excellence Nanosystems Initiative Munich (NIM) have established and investigated for the first time a complex biochemical system. They discovered a surprising diversity. An almost infinite number of complex and interlinked reactions take place in a biological cell. 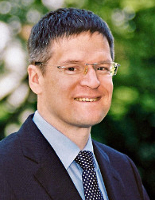 In order to be able to better investigate these networks, scientists led by Professor Friedrich Simmel, Chair of Systems Biophysics and Nano Biophysics at the Physik-Department, Technische Universität München (TUM) try to replicate them with the necessary components in a kind of artificial cell. This is also motivated by the thought of one day using such single-cell systems for example as “nanofactories” for the production of complex organic substances or biomaterials. All such experiments have so far predominantly worked with very simple reactions, however. 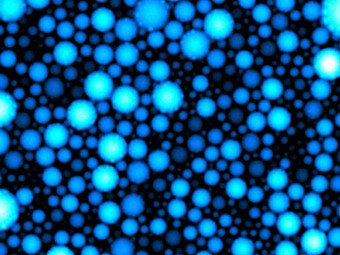 NIM Professor Friedrich Simmel and his team have now for the first time managed to let a more complex biochemical reaction take place in tiny droplets of only a few micrometers in size. Together with co-authors from the University of California Riverside and the California Institute of Technology in Pasadena, USA, the scientists are presenting their findings in the current edition of Nature Chemistry. The experiment is conducted by putting an aqueous reaction solution into oil and shaking the mixture vigorously. The result is an emulsion consisting of thousands of droplets. 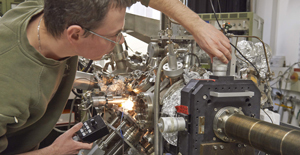 Employing only a tiny amount of material, the scientists have thus found a cost-efficient and quick way of setting up an extremely large number of experiments simultaneously. As a test system, the researchers chose a so-called biochemical oscillator. This involves several reactions with DNA and RNA, which take place repetitively one after the other. Their rhythm becomes visible because in one step two DNA strands bind to each other in such a way that a fluorescent dye shines. This regular blinking is then recorded with special cameras. In the first instance, Friedrich Simmel and his colleagues intended to investigate the principal behavior of a complex reaction system if scaled down to the size of a cell. In addition, they specifically wondered if all droplet systems displayed an identical behavior and what factors would cause possible differences. Their experiments showed that the oscillations in the individual droplets differed strongly, that is to say, much stronger than might have been expected from a simple statistical model. It was above all evident that small drops display stronger variations than large ones. “It is indeed surprising that we could witness a similar variability and individuality in a comparatively simple chemical system as is known from biological cells”, explains Friedrich Simmel the results. Thus, it is currently not possible to realize systems which are absolutely identical. This de facto means that researchers have to either search for ways to correct these variations or factor them in from the start. On the other hand, the numerous slightly differing systems could also be used specifically to pick out the one desired, optimally running set-up from thousands of systems. The research was funded by the National Science Foundation, the European Commission, the German Research Foundation’s Cluster of Excellence Nanosystems Initiative Munich (NIM) and the Bavarian Elite Network. Maximilian Weitz, Jongmin Kim, Korbinian Kapsner, Erik Winfree, Elisa Franco , Friedrich C. Simmel.